How to Pursue Membership in the Prestigious Daughters of the American Revolution for Jacob Minerd Sr. The "father of us all," Jacob Minerd Sr., has been recognized since 1998 as an American patriot by the Daughters of the American Revolution and by the United States Veterans Administration (VA). Jacob is credited with serving during the war in the Berks County (PA) Militia, Captain Foch's Company, 3rd Class. If you are a direct descendant of Jacob's, you should be eligible to join the prestigious DAR -- a volunteer women's service organization dedicated to promoting patriotism, preserving American history and securing America's future through better education for children. In 1998, cousin Alice (Lange) Jacobs, of Oklahoma, was the first of our cousins to be accepted into the DAR based on Jacob's service, thus paving the way for others. She is a descendant of Nathan Miner, an Iowa pioneer. The prestigious Daughters of the American Revolution have put a hold on applications for membership based on Jacob Minerd Sr.'s wartime record. Until recently, two pieces of known evidence proving Jacob's service were acceptable to the DAR, but not any more. The first is his oath of allegiance to the newly formed United States, signed on Nay 30, 1777. The second is a listing that he had been fined as a member of Berks County Militia, Captain Foch's Company, 3rd Class, as published in State of the Accounts of Jacob Morgan, Senior, Late Lieutenant of Berks County. In the DAR's view, Jacob's "fine" could have been assessed for absenteeism, meaning he "might not" have served at all. We are seeking to find additional documentation but also hope the DAR will reconsider its extreme position. Then, in 2002, cousin Marilyn (Jenkins) Prinzing of Illinois became the second cousin to receive this distinction. She has been Regent of the Ansel Brainerd Cook Chapter, Libertyville, IL and was a candidate in 2009 to be a voting delegate at the DAR National Continental Congress in Washington, DC. Marilyn is a descendant of John Homer Whetzel. In 2003, Doris (Sands) Hawker was admitted into membership under Jacob's line. She is a member of the Zackquill Morgan Chapter in Morgantown, WV. She is a descendant of Sadie (Harbaugh) Ream. Marilyn has offered to provide general advice for you if desiring to begin your quest for membership. It requires compiling valid, unquestioned documentation of your lineage back to Jacob, generation by generation. This is not easy work. While you will need to research and assemble the paperwork yourself, Marilyn is willing to share her experiences and provide strategic guidance. Click here to send her an email. 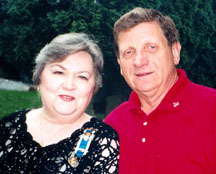 In 2002-2003, Marilyn also provided a valuable service to our family by chairing our Jacob Minerd Gravestone Committee, to obtain an official US military marker for Jacob, and by speaking at the consecration of the marker at our 2003 national reunion.